We live in a consumer driven society, acquiring lots of things whether we have space to store them or not. Some of us love the challenge of getting and staying organized, so we're always looking for new organizing gadgets. 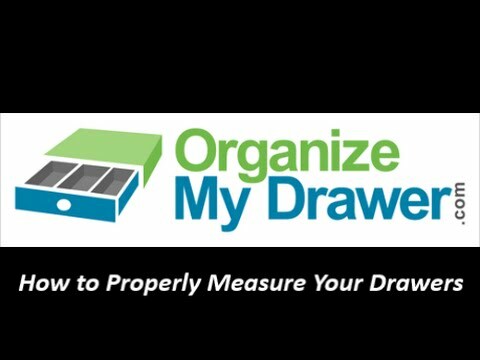 At the International Home Builder Show (IBS), I discovered a company called OrganizeMyDrawer.com, with a unique approach to organizing lots of little things in drawers. Loved the idea and volunteered to use their design tool and product. Wanting to show you that it's easy to organize your kitchen drawers, I started with the most challenging drawer in my kitchen, the “junk drawer”. With Organize My Drawer products, it's a bit like designing a house. You've got to get the design right on paper, as once built, it's not easy (and definitely not cheap) to make changes. It seemed like more work than I'd anticipated, but after spending a week with my junk drawer open, I realized it was really helpful. Does this gadget belong in the kitchen? Are there tools and sewing supplies in a kitchen drawer, to save a trip to the garage or sewing room? You might need a basket to collect these things, left by the door so you can grab items when you're headed in the right direction. Does this kitchen gadget belong in this drawer, or is there a better drawer closer to where I use it. For example, I moved my plastic wrap and aluminum foil to a narrow drawer near the stove. Does this item need a permanent home in this kitchen drawer? It was easy to say yes to my scissors and tape. However my oatmeal baggies I forgot to take on a recent trip shouldn't be there long. I also need to find a better place to store miscellaneous tea bags and K-cups, closer to the Keurig and coffee cups. When measuring drawers, like windows and door openings, you need to measure both ends and use the smaller one. Once I finished getting rid of things, it was much easier to empty the drawer. I laid everything remaining out on the countertop, and organized things so I can see things and grab everything easily. Then it was time to take measurements which will get transferred to Organize My Drawer's online design program. They've got some great videos to help you through the design process, starting with How to Measure Your Drawer. I didn't find these right away because they're at the bottom of the left navigation bar, and required me to scroll down to see them. You'll want to watch the videos before you start measuring, which will make things much easier than my detailed measurements down to the 32nds of an inch. Drawer measurements – 18 15/32nds (ordered 18.375 in”) wide by 17 19/32nds (ordered 17.5″) deep; forgot height, which is 3 20/32nds (ordered 3 inches). Storage baggies – sandwich baggies are 6 inches wide, and quart storage bags are 7 1/4 inches wide. At this point I got a bit frustrated because I didn't seem able to edit the template I selected. Turns out you have to create an account, before you can edit anything … so once I did that, it was easy, sort of. I started my design on the right hand side of the drawer where the biggies will live. I eventually learned that I was working opposite the grid (starts in the top, left corner), so you'll find it easier if you start there. Before you start designing your drawer details, do some simple math and make sure that the number of columns you're planning is realistic. Simply divide the width of your drawer by the number of columns, and test the column width on your biggest item to be stored. If you look at my countertop design, there are six columns. It didn't take me long to realize that wasn't realistic, so I rearranged things into five columns. Now look at my design for five columns (above) and it's obvious that something has to change. So back to the drawing board as I was much too generous on column widths when I thought I had plenty of room. The real decision came down to whether I was willing to combine gadgets in order to have one column wide enough for the hammer (see below, 4.5 inches). So click to see if the hammer is in … or out, laugh out loud! PS You'll also get my list of recommended steps to design your new drawer inserts from OrganizeMyDrawer.com.